Tony B here, sneaking in a short entry from a short trip to Napa (shh, don’t tell Jane I’m writing this). While the Barossa is basking in sunny warmth, things are chilly here. Wet too, which is good for the vines if not for me. Even wet and beautiful the Napa Valley is gorgeous. And the food is great too. Dinner last night at La Toque was memorable. Though they are known for their wine pairings with their small plates, we took our own bottles: 2004 Mesh Eden Valley Riesling, which has years left to develop, and 1997 Arns Napa Cab, which was right where you want it to be for drinking now. All the dishes were delicious, well thought out, and unpretentiously presented, but my favourites were the quail with chestnut gnocchi and the antelope, with it’s mellow gamey presence. A little treat for dessert was a small cube of raspberry paste with such intense berry flavour. If folks here in the US need any more encouragement to try Australian Rieslings, they should have been with us at dinner. The pairing of the night was the Mesh with parsnip soup. The bit of bottle age blended with the earthy parsnip while the Riesling’s acid lifted the flavours and reminded you that it’s still there. OK, I better get back to work now. Tonight it’s the taco truck for dinner! What a nasty hot bushfire day we had yesterday. Thank goodness it’s cooled down overnight, with even a few showers this morning. Looks like we’re in for a long hot summer! It’s nice and quiet at the winery today – pretty much everyone knocked off at lunch time yesterday, so it’s just the skeleton crew in today. We’re going to lash out and get pizzas for lunch from Damon, our local gourmet prize-winning pizza man down the street at Roaring Fordies. **News Flash! Damon won the Best Gourmet Pizza in Australia award earlier this year with his “Smokey”. On a base of tomato and mozzarella cheese, he uses the best from the Barossa butchers: mettwurst (never lets on if it’s plain, garlic or brandy, or which butcher), lachsschinken (German-style prosciutto – again varies according to the butcher – Linke’s in Nuriootpa is my favourite), double smoked bacon (nowhere else but Schulz’s butchers right here in Angaston), and smoked chicken. In fact, Damon is off to Las Vegas in March 2010 to compete at the World Gourmet Pizza Titles with the Smokey, and seeing as I’ll be based in California that month, there’s every chance that I’ll get there to be part of the local cheer squad. 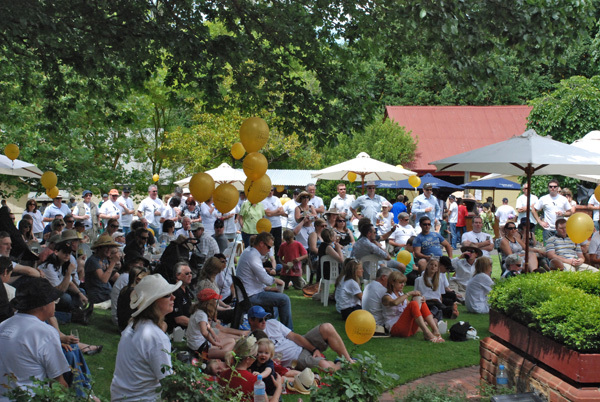 So we’ve finished the 160th Birthday Year off with our Yalumba Winery Christmas Party last Sunday, where the Hill Smith family invited everyone who works for Yalumba (as well as those who have retired) to come along with their families for a proper picnic on the front lawn. We had wood-fired pizzas, duck or Italian sausage sandwiches, fish or squid and chips, and strawberries and ice cream. 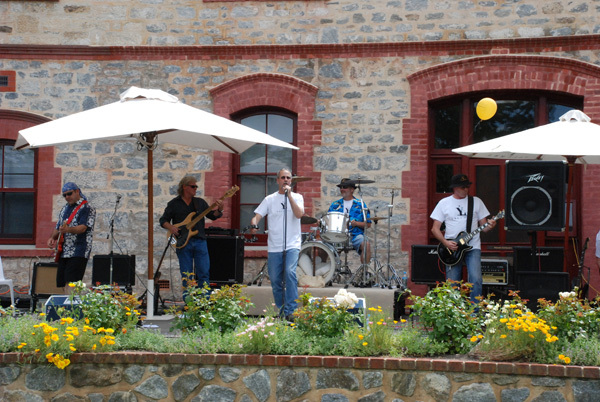 What a lovely lazy day, and we had our own blokes from the cellar and services who make up the band “Boiler House” play a set in front of the Clocktower. I actually took a video of a couple of songs so you can check them out, but have to wait until Ryan comes back from holidays – just not high tech enough to get the vid onto the blog! But once that’s done and I figure out how to do it ongoing – you’ll be in for a treat as I make film clips on my next job away and put them up myself. Which brings me to my next job away. I’ll be at the winery until the 12th February, then off to California for two months to work with our distributor The Henry Wine Group. Good deal for me, as I’ll be based out of San Francisco, but working right throughout the state. We did a slide show from The Mission district back in August, so this trip I’ll try and get you a bit of a look behind the scenes in Hollywood, Alcatraz, the Del Coronado Hotel in San Diego – some genuine tourist hotspots! Then it’s through to the Vancouver Playhouse Wine Festival from the 19th – 25th April, where New Zealand is the featured wine country, and we’re part of The Rest Of The World. I’ll be travelling with Katy from the Nautilus winery in Marlborough, so we should be able to get into a reasonable amount of trouble between the two of us! Vancouver will still be in party mode from hosting the Winter Olympics in Whistler, so it will be a special time to be in what is already a great town any old time. Then back to Australia for the release of Yalumba’s Rare & Fine reds and the whistlestop tour across Australia with a calendar of what has developed into mostly annual events. And hey ho – it will be July!So get ready at the Riverine Club in Wagga (I’ve already shipped in two 3 litre double magnums of back vintage Signature), the Silver Spoon and Hale Road Tavern in Perth, Old Bridge Cellars in Fremantle, the Spotted Cow in Toowoomba, the Canberra Food & Wine Club, Cafe Salsa up in Port Douglas, the Blue Sky Brewery in Cairns, Watermark and A Touch of Salt in Townsville – we’re coming back! Not to forget that we’ll be opening a new wine bar in Townsville this trip for Patricia and Rob Rose (Rob used to be the captain of the Townsville Crocs basketball team) called Vine 21. All good stuff. Until then, I hope the Holiday Season and the New Year treat you well wherever you are, and we’ll see you – either on the road in your part of the world, or here at the winery – when it’s 2010. We’re just saying goodbye to one of Santa’s elves, who has been in the office this morning handing out little presents in our office (one of the lasses that works in our section – her 4 year old daughter complete with santa hat and bell on the end!) so everything is hurtling with Festive Season flavour toward the last working week of the year. I’ve been off the air just trying to settle back in, and it’s the classic situation – once you stop (the travel) you drop. So it’s off to the relevant operators to get patched up ready to go back out there again. Yesterday it was a nice long session with the dentist, after splitting a piece of tooth off at the end of the USA job. Next it will be back to the Nuriootpa swimming pool to stretch out the back, and build up for what looks like a massive year working 2010 mostly in the USA arena. But I was able to get along to Carols By Candlelight here at Yalumba on Wednesday night, a big turnout on a warm evening. Special mention to the troops from Heggies Vineyard who put on a magic sausage sizzle – and even had BBQ as well as tomato sauce! True gourmets, our folks. It’s a treat to see this sort of thing under way at the winery, because when you spend so much time offshore talking about this amazing region The Barossa, then this special spot in it – Yalumba – and then you see it on a night like that with hundreds of local folk doing the local get together thing – it is special. The Angaston Primary School Choir in full flight belting out “Celebrate …. good times … come on!” might be my lead line for working away next year. Any rate, I’ll do a lap of the winery on Monday morning and let you know what everybody is up to, and if the weather is any indication, we might be in for an early vintage. So now that I’m officially back on the air, this will get Tony, the bloke who makes the blog look good, off my back and we’ll try and get some pictures up so that you can seewhat the Valley looks like pre vintage. Oh – by the way! It’s our Christmas party this Sunday for all the folks at the winery, and seeing as it’s our 160th Birthday year, the chief has invited everyone who works for Yalumba, the vineyards – everybody from the golden oldies (the retired folk who used to work for Yalumba and still live in the region) and their families along to a picnic at the winery this Sunday. I know there’s strawberries and ice cream for dessert, but everything else is a mystery – so we’ll get some photos of that up as well. It will be a great day, and the last event in the Birthday year program – wouldn’t miss it for the world! 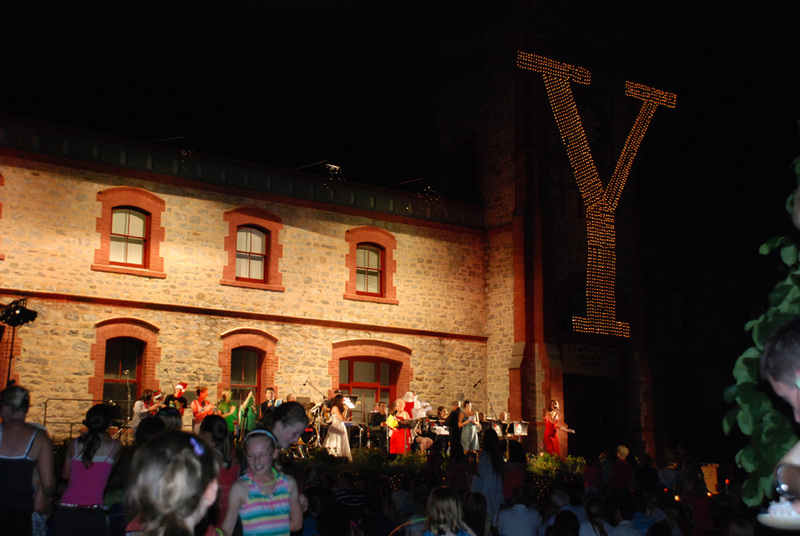 It is Yalumba’s turn once again to host Carols by Candlelight, a lovely evening of music, food, wine, and simple enjoyment. Join us Wednesday, 16 December. Donations to charity. Find out more here. Hi Honey, I’m home! I’m back on terra firma here in the Barossa Valley, trying hard to get back into the local time zone as easily as possible. It’s that three or four nights of waking up bright and sparky at 3am that’s a killer! But here we are, serious green canopy development on the vines everywhere and lots of visitors to the winery. I’ve just packed our lass from Austria off to Oxford Landing vineyard with Matt “Luke Skywalker” Pick – the winemaker – with a bag of bacon & zucchini muffins for Freddy and the boys up there. I will be off to pick our Canadian journo up from Henschke’s in an hour or so. 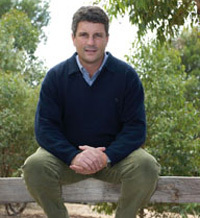 Then we’ll be up to Pewsey Vale vineyard to try all the Rieslings off that 120 acres – in the vineyard. There’s a twist in the weather today, so I fully expect it to be blowing a gale up there. It’s been warm too, which is liable to bring the brown snakes out, so I’ll be keeping us on the white crushed gravel tracks up there so we get a bit of warning should one of those nasties take an interest in us. I saw a very healthy 6 foot specimen swim across the road the other day, so I know they’re starting to move! Apart from that, it’s fabulous to be home. First stop off the plane was the Vili’s pie and cake factory near the Adelaide airport, where they have a 24 hour cafe – for a turkey and salad sandwich on bread just baked, and a half pint of Farmers Union iced coffee – the best! Then into the Barossa, for a currant bun from Apex bakery, and my own pizza from ’40s Cafe – thin crust, ham, pineapple, double cheese and pepperoni. Yep – all’s right with the world for a bit. I promise to get back into the writing saddle and post something every day – I’m thrilled to bits with the fact that folks tune in to the blog and get a bit of a lift / laugh/ burst of information on several fronts – travel, food and wine – so thanks for reading. And it’s a great moment to slot back into the Barossa social calendar. Tomorrow night Santa visits Tanunda with the Holiday Street parade, so that’s where we’ll be to catch up with everyone and have a bit of a sausage sizzle to kick off the Festive Season. So jingle bells and bring on the holiday goodwill, and I’ll see you later.